Electric charge is a fundamental property of matter, the most common charged particles are the electron (negative) and proton (positive) which are oppositely charged particles in the atom. Oppositely charged particles attract and like charges repel. Materials which conduct electricity are metals (iron, copper, alluminium etc) and also carbon, in the form of graphite. All other types of material are electric insulators. meaning you cannot pass an electric current through them. However, these insulating materials (like plastic) can be charged by friction. This is because the material is either loosing or gaining electrons. The electrons will go from one item to another. This charging of insulative materials can be seen everyday. For example, if you have a jumper, when you take it off you may find your hair standing on end because it has rubbed against the jumper. You can also get shocked by the rubber handrail of an escalator because it has gradually become charged from rotating. 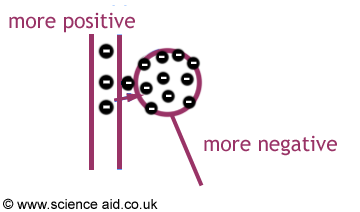 The diagram below shows how electrons are transfered when you rub a balloon against some fabric. This electrostatic charge can have some serious dangers. When an aircraft is being refueled, the friction causes charge separation: where the aircraft has an opposite charge to the fuel. If the voltage becomes high enough it may cause a spark. Igniting the fuel and causing a fire. To prevent the framework from building up charge, it is connected to earth, so that any charge can disperse, and fire is prevented. As well as dangers, electrostatic charge has many uses. A common one is in painting metals to create a smooth, even spread of paint. As paint comes out of a nozzle it is positively charged. This causes the droplets to seperate and spread out because like charges repel. The metal plate is earthed, and electrons flow from earth causing it to become negatively charged. The paint is attracted to the metal because opposite charges attract so there is an even coverage.